My son is five years old, and though he’s only been on this planet a short time, he’s already done a bit of traveling. We’ve taken numerous long car trips since he was about two years old, and one plane trip so far from the midwestern U.S. where we live to Ontario, Canada. I would be a liar if I said that each of these trips went smoothly. Sometimes, the screams and tears cannot be avoided, and can only be gracefully survived by all. However, my family has had a lot of positive road trip experiences, and today, my son is pretty much a car ride pro (up to a certain number of hours, of course). While I confess that I don’t have secret foolproof advice for getting toddlers to behave mid-route, I have learned from traveling with my little guy that some things can greatly help to increase everyone’s happiness and sanity on the road (and in the sky). It’s not easy to travel with a two or three-year-old, but it doesn’t have to be absolute mayhem, either. Next time you’re traveling with your toddler, try these nine things — they help. The clothes really do make the difference. When a toddler is itchy, hot, cold, feeling constrained or uncomfortable in any way, they are much more likely to get upset. Sometimes they don’t even have to be uncomfortable; if something about a clothing item annoys them, it can become a huge problem while you’re driving or sitting on an airplane. Your best bet is to dress them in light, comfortable clothes that they like, and pack a couple light layers if necessary. Also, don’t forget a change of clothes. A hungry toddler is a frightening force to be reckoned with, so be sure to keep your little one’s blood sugar levels stable. Small containers of sliced fruit, veggie sticks, mixed nuts (if your toddler is old enough to chew them properly) and other yummy and portable snacks are essential. Keep them in your backpack and administer to your toddler on an as-needed basis. You don’t want them to have all of the snacks all at once. This will just lead to a huge mess and demands for more snacks later. Coloring is universally soothing to children and adults alike… but especially to children. If you’re going on a long trip, you’ll want several coloring books. For a drive from Michigan to Tennessee, I packed three or four coloring books, and gave them to my son one at a time. When he got bored with one, I gave him another. If you’re waiting at the airport, try coloring with your toddler — it really is relaxing! Make sure kids have plenty of activities to keep them entertained. You’ll want to switch up coloring with as many other activities as possible, without your backpack becoming too heavy. As you know, the attention span of a toddler is about five seconds to 2.5 minutes. Hand-held puzzles like a Rubik’s cube are great — your toddler probably can’t solve it, but can have fun spinning the cube and trying anyway. Flashcards are fun, and the Etch-a-Sketch is classic. Of course, there are also tablet games if you have those. In your backpack, include a few trinkets to entertain your toddler. Keep these hidden, and only bring them out once your little one is restless and the current round of coloring books and puzzles isn’t cutting it. They’ll be happy to have a surprise, and this will keep them engaged for a bit. Don’t bring out a second trinket until you need to, and repeat as necessary. 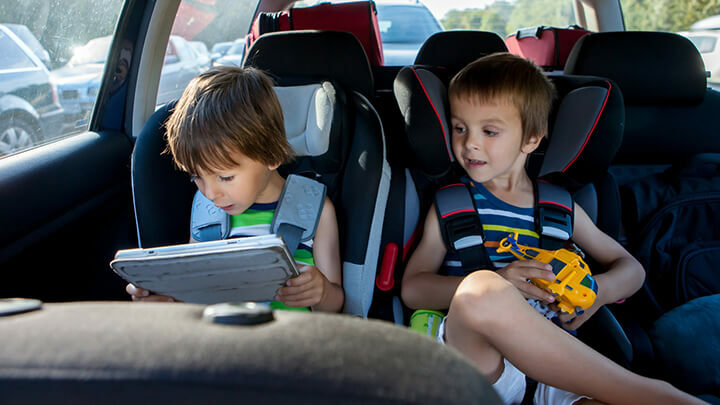 If you’re driving, the road trip music you choose can have a real impact on your journey, especially if toddler mood swings are involved. Choose something that everyone enjoys — you don’t want the adults getting twitchy and irritated due to an ongoing reel of children’s songs. Try something upbeat. Slower music may help calm things down if they get intense. And beware of heavy metal; it may get your toddler a bit more amped up than you’d like. You’ll need them. Bring a baggie or two (or three)… or just a big box of the cleaning wipes of your choice. Messes will be made on the road, hands and faces will be sticky. You’ll be happy you have the cleaning cloths. Also, you may want to bring a bag to throw dirty cloths into. If you’re on a road trip, find places to get out and play. Sitting for extended periods of time is horrible for everyone’s health, and it will most certainly make your toddler antsy. If they sit for too long without moving around, they will then vocalize those feeling loudly… over and over. You can minimize the evil effects of prolonged sitting by making regular stops to get up, stretch and walk around. 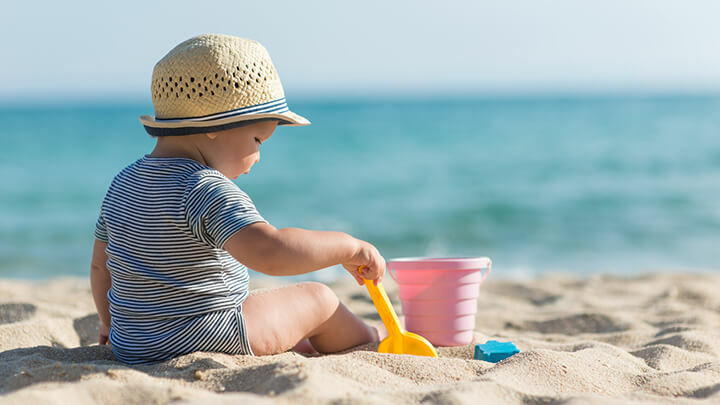 If you can, plan your trip around places that you can get up and stretch for a while, perhaps even a place for your toddler to run around a bit. If you’re flying, make a point to trek across the airport if you have time. This may entertain your toddler, and perhaps encourage a nap. When you’re on the plane itself, you can at least walk up and down the aisles. I’m not saying your toddler should have unlimited hours of road trip screen time, but a 90-minute movie very likely isn’t going to hurt anything. It may give all of you some much-needed stress relief. Don’t feel bad about it, this is about survival. What other methods do you use to keep sane while traveling with your toddler? Please let us know! Hey Buddy!, I found this information for you: "9 Ways To Travel With A Toddler Without Losing Your Mind". Here is the website link: https://www.thealternativedaily.com/9-ways-to-travel-with-a-toddler-without-losing-your-mind/. Thank you.